Officials believe the incident "was linked" to one late last month when hackers breached the White House's unclassified computer network, State Department press office director Jeff Rathke told reporters. The State Department had initially said in an email late Friday that the shutdown came as scheduled routine maintenance to its main unclassified network, and would impact email traffic and access to public websites. But on Monday, Rathke said the department had recently detected "activity of concern" in portions of the system handling non-classified emails, and the weekend maintenance included security improvements responding to the breach. "We have no reason to believe classified information was compromised," Rathke told reporters. 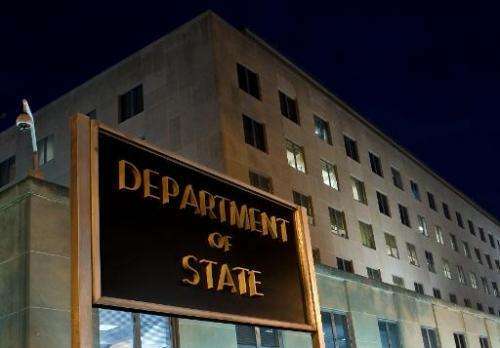 He said the State Department's secure, internal communication system within the building and linking US diplomatic posts worldwide were operational, but that the Internet-connected systems remained down on Monday. "We are implementing carefully planned improvements to the security of our main unclassified network, taking advantage of a scheduled outage," Rathke added. "No classified systems have been affected by this incident." Rathke said the origin of the cyber breach and who might be responsible is "something that remains under investigation." The State Department is the latest in a series of government agencies to face cyber security breaches. Last month, the White House reported an intrusion in its unclassified computer network. In the course of addressing the breach, some White House users were temporarily disconnected from the network but the computers and systems were not damaged, an official said. The Washington Post quoted sources as saying hackers believed to be working for the Russian government were believed to be responsible for that breach. Last week, the US Postal Service said hackers stole sensitive personal information from its employees in a large data breach this year, and got took some customer data as well. A USPS spokesman said the breach affected as many as 800,000 people who are paid by the agency, including employees and private contractors. Let's not do anything. If you do anything to stop it that would mean that you approved of the break in. Someone should tell men not to break into the State Department computers. That always works. Trolling is doing nothing either, except proving that you're a halfwit. This is a political/national security article and has no business being here. Look at the top of the page. This article comes under the heading of "Technology". No one forced you to read the story. How much are you paying for your subscribition? Security is going to be the downfall of the internet. A great experiment into how people could live if everyone was cooperative, but fails in real life.